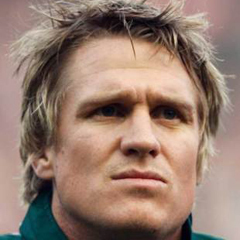 Port Elizabeth - A loss against England in Port Elizabeth on Saturday would curb precious momentum the Springboks have accumulated, captain Jean de Villiers said on Friday. Any talk of the test being a "dead rubber" was rejected by the Springbok team management this week, and it was emphasised that there was still a lot at stake, despite the series already being in the bag. "The reality of it is if we do get a win tomorrow (Saturday) and a good performance then we do have a bit of momentum," said De Villiers. "And if you do lose, you sort of start from scratch again." A clean sweep over England would hold the Boks in good stead ahead of the Rugby Championships against Argentina, New Zealand, and Australia starting in August. De Villiers said the aim was always to win the series 3-0, but he added that a white-wash would not come on a silver platter. "We are obviously keen to do that (win the series 3-0). It is much easier said than done and we know it will be a tough game tomorrow (Saturday)," he said. "It is test rugby and it is never easy. So we are looking forward and there is still a lot we need to build on, so hopefully we can just have an improved performance." De Villiers said England was eager to return home with a psychological victory over the Boks. "I don’t think it is ever a dead rubber when you play for your country and definitely not against England," he said. "There is a lot of pride to play for. They want to go home with at least one test win and we don’t want to give them that." He said while the team wanted to finish the series with a 100 percent record there were also some players who would want to stake their claim in the side. "We want to put up a good performance tomorrow to improve as a team and I am sure those guys coming in want to establish themselves in the starting line-up. "It is a special day for Pierre Spies as well, playing in his 50th game. We have a lot to play for." De Villiers’ centre partner for Saturday, Wynand Olivier, is one of the players who has a point to prove when he runs out in his 37th test. Olivier has been part of the Springbok set-up since the Jake White era and has only a few starting berths to show for his efforts. While he has been a stalwart for the Bulls, he is yet to produce the same results in the Springbok jersey. "We’ve played a couple of games together and we know each other very well and we enjoy playing together," said De Villiers. In the same vein, Elton Jantjies has also held his fair share of tackle bags since he was first called into the Springbok setup in 2010. He could earn his first cap for the Boks off the bench which could prove to be a proud weekend for the Jantjies family. His younger brother Tony Jantjies is playing in the Junior World Cup final against New Zealand on Friday. "Elton has been on a couple of Springbok tours and never been able to play a Test and [he may] finally get that opportunity, hopefully tomorrow," De Villiers said. "That is great for him and with his brother competing in the Under-20 final today as well, it is quite a special weekend for the whole Jantjies family."